The kitchen is not only the location for much of our household consumption, it’s also the source of much of our household waste production, including one of the worst greenhouse-gas-producing waste products — food waste. According to a National Resources Defense Council report, getting food from farm to table uses 10% of our nation’s energy budget. This morning on MPR, Jonathan Foley, director of the Institute on the Environment at the University of Minnesota, said that we use about 40 percent of the (non-ice-covered) land on the planet to grow food, and “70% of all the water we consume is used to irrigate crops.” Agriculture is one of the biggest contributors to climate change. That’s an extremely costly food chain and yet approximately 40% of all food produced in the world is never eaten. According to the EPA, 21% of our municipal waste is food waste. More food goes to landfills and incinerators than any other type of material. Not only are we losing an estimated $165 billion in food that could be used to feed hungry people, but food in landfills produces methane as it decays. Methane is 21 times more potent as a greenhouse gas than carbon dioxide so this is a very big deal. Landfills are the source of 20% of all methane emissions. With the kitchen remodel we wanted to see if we could reduce food waste — and encourage recycling — with better design. There were three locations in our kitchen were food waste occurred: the refrigerator, the fresh food bowls on the counter, the longer-term storage space. Refrigerator: We looked at a variety of refrigerators. If money were no object, we probably would have chosen refrigerator drawers because it is easier to see all the food in the drawer. But as I noted in an earlier post, drawers are expensive and the ones we could afford were less energy efficient than standard refrigerators. A larger countertop fruit bowl with air circulation should keep the fruit visible so it gets eaten. We decided on a 17 cubic foot countertop-depth refrigerator. Not only did it fit our tiny space well, but because it is shallower than a standard fridge, we can see and reach to the back of each shelf. Food can’t hide. Fresh Food Bowls: We had numerous fresh fruit/veg bowls on the counter and hanging by the window. 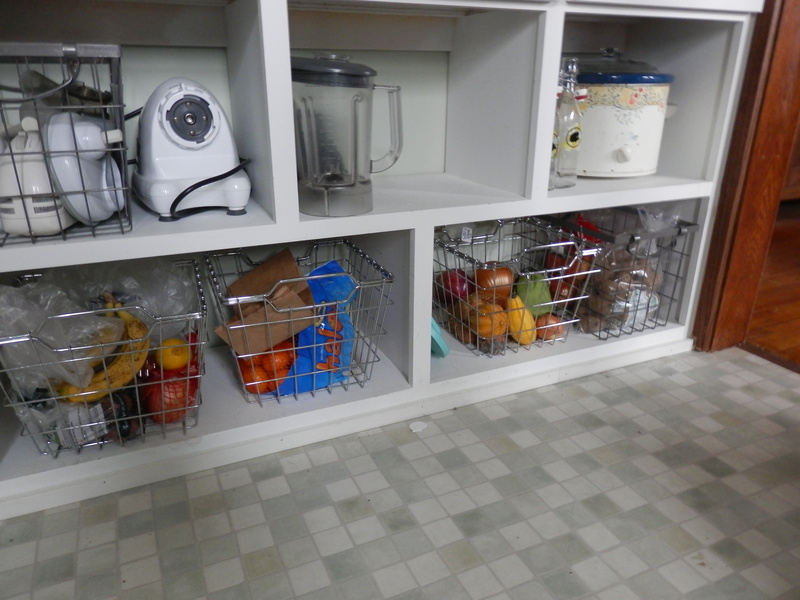 These were replaced with one multi-level countertop bowl made of wire that promotes air circulation. Longer Storage: It’s happened one too many times that we’ve walked into the kitchen and wondered where that awful smell was coming from, only to discover rotting onions or well-sprouted potatoes or liquid apples inside a cabinet. To prevent the problem of “out of sight, out of mind,” we decided to use wire baskets on open shelves for storage of these kinds of foods. With a smaller fridge, we need to buy less and shop more often. This means our food will be fresher and since we can ride our bike to the grocery store, we might get in more exercise, too! When we grow our own food, we can harvest as needed and not refrigerate food at all. Harder for me to learn is to cook the proper amount of food so we don’t have a fridge overflowing with leftovers. Although it’s been years since the kids left home, I’ve only managed to recalculate my cooking down to 4 people, not the 2 who actually comprise our household. Not that leftovers are bad. We love them — when we remember to eat them. The key to leftovers is creating a system so you know when the food went into the fridge and then eating it before it goes bad. That’s a design issue I’ll tackle another time. Our household food waste gets composted either in our worm bins, in our home compost bins, or by the City of Minneapolis organics composting program. We wanted to ensure our design of the kitchen allowed for the various kinds of composting we do but I didn’t want to fill the counter with compost containers. In the best of all possible kitchen design worlds, we would have had holes cut in the back of the counter where compost could have been pushed down into the right container for its use. But we don’t live in that perfect world. 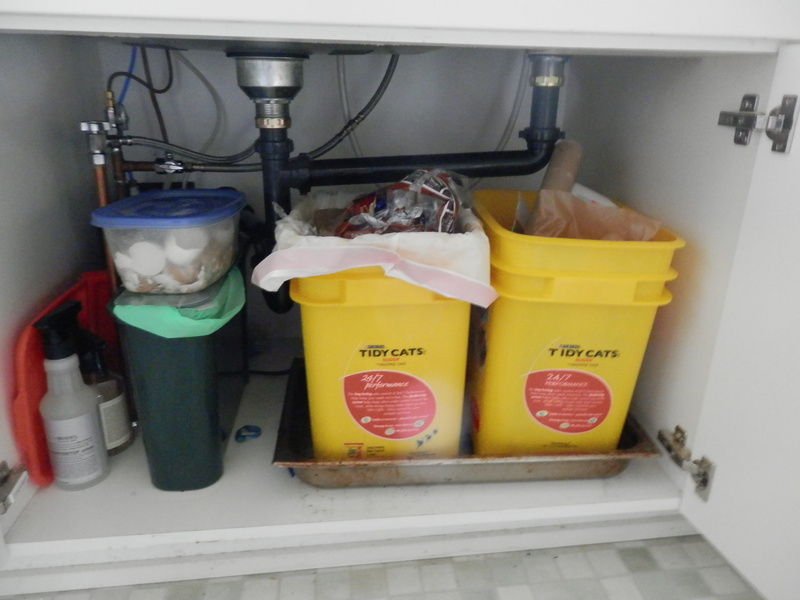 Our solution is one countertop bin that holds a combination of worm and compost-bin scraps and one taller, narrow bin under the sink for city compost. “Special” scraps, like egg shells that I’ll be drying and grinding to put in my tomato bed, are put into small plastic bins under the sink until they are used. Narrow bin holds city compost and two kitty litter bins were just the right size for garbage and recycling. There are a lot of miscellaneous items that could be recycled … but where to put them so the kitchen doesn’t become a dumping ground. We decided on a large sink cabinet (36″). With such a large space, we no longer have to look at garbage cans in the room and there is plenty of space for a compost bin, a recycling bin, and a garbage bin. 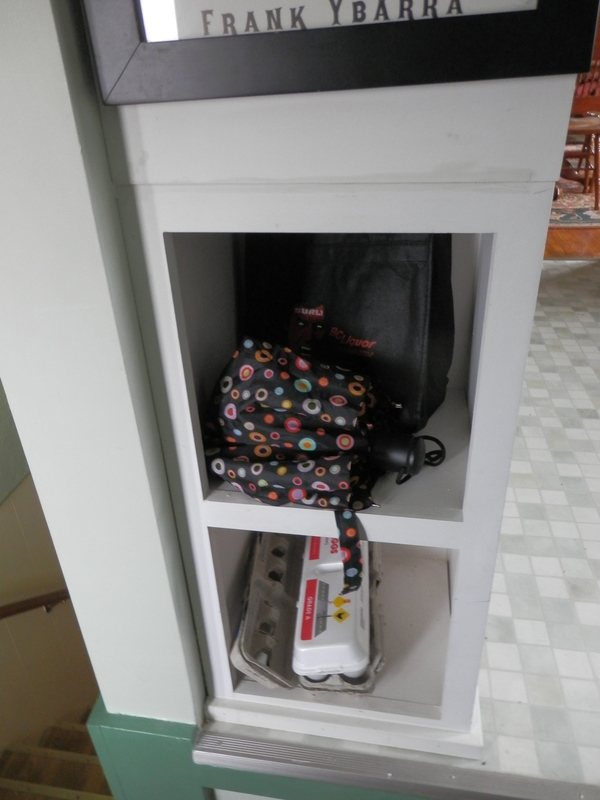 These cubbies hold items leaving the house to be returned for recycling or reuse. Once again, design can only goes so far. We need to continue to develop better habits. In particular, we need to continually challenge ourselves to buy food with little or no packaging. * I am not paid to advertise any products or services, nor am I promoting a product, service or company. 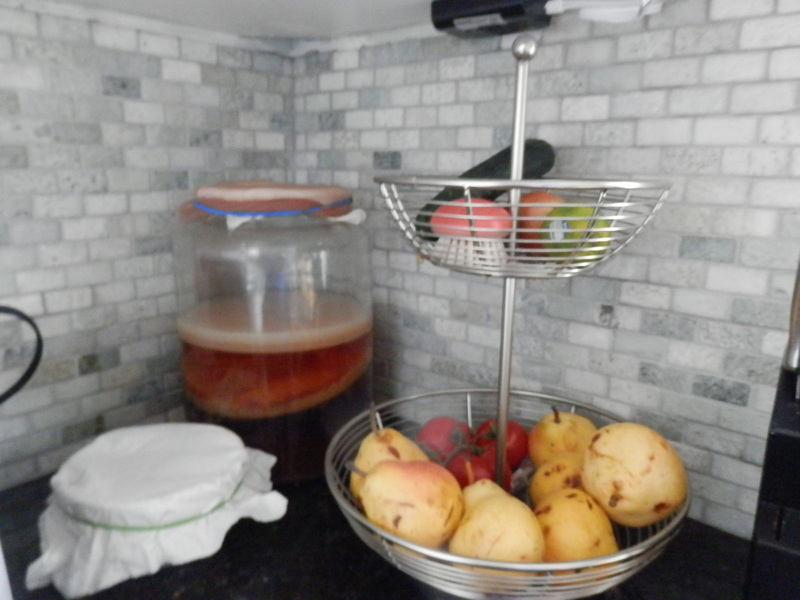 This entry was posted in Food/gardening, mini challenges, Reduce/reuse/recycle and tagged food waste, recycling. Bookmark the permalink. Thanks for all you do for our neighborhood and our world. I always enjoy your posts. I had a chance to tour a composting site – the Mulch Store – and a recycling plant last week as part of the Master Recycler class run by Hennepin County. So much to learn – so little time…. Great thinking overall, but make sure you consider which fruits and veg you are storing together, especially ones that produce ethylene gas and accelerate ripening (and spoiling) of their neighbors: http://www.thekitchn.com/food-science-ethylene-gas-130275, and think about things that should be stored in the dark (like potatoes). That is a really good point! Thanks for the link.